It's Pub Night: Don Younger, R.I.P. The Horse Brass Pub announced Tuesday that it would be closed for regular business on Sunday, February 13, 2011 for a wake to honor its owner Don Younger, who died January 31. The Celebration of Don's Life will be held from 2 to 6 PM at the Horse Brass. The back parking lot will be tented to allow for more people to attend. "Hundreds, if not thousands, of people around the world who knew Don and loved Don aren't able to be there in person," says organizer Lisa Morrison. "So we are having a worldwide toast -- a virtual wake, if you will -- to help bring us all together, at least in spirit." Whatever you are doing, and wherever you are at 3 PM your time on Sunday, February 13, make sure to hoist a glass to Don. Here's a picture of Don that I dug out of the archives -- it's from May 23, 2008. 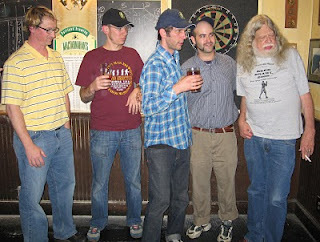 I think he's awarding the Glen Falconer Brewing Scholarship to Patrick Miller (far left) and Vasilios Gletsos (next to Don). Also pictured are the winners of the scholarship from the previous year, Jacob Leonard and Corey Blodgett. Just goes to show you that Don's involvement in the Oregon beer scene didn't end with bringing the notion of a taphouse to town, or with encouraging the beginnings of regional powerhouses like Portland Brewing, Widmer, Hales, and Bridgeport. He never stopped contributing, as with the Falconer Foundation, which enables local brewers to further their professional education at the Siebel Institute. Think of the brewing ferment (pardon the pun) that is reflected in that picture: since it was taken Jacob has left Walking Man for Widmer, Corey has left McMenamins for Maritime Pacific, Vasili has left Rock Bottom for MacTarnahan's, and Patrick has been involved in the Oregon Brew Crew collaboration with Rogue at the Green Dragon. That picture is a tiny window into the legacy that Don left -- a legacy that will live on for many years. I didn't know Don well myself. Maybe one reason is that I started spending more time at the Horse Brass after Oregon's ridiculous smoking ban kicked in, at the same time he started spending less time there. While it is sad to see him go, the outpouring of love and admiration that followed his sudden hospitalization and death has been truly inspiring. Most of us will be unable to touch as many people as Don did. But we can strive to live a life that, when it's over, leaves people reminiscing about the good times, and about the good we've done in the world. See you at the wake. If you're participating in the worldwide global toast, put something up on Twitter with the tag #DonYounger. Lovely wake. Free beer and food was served.